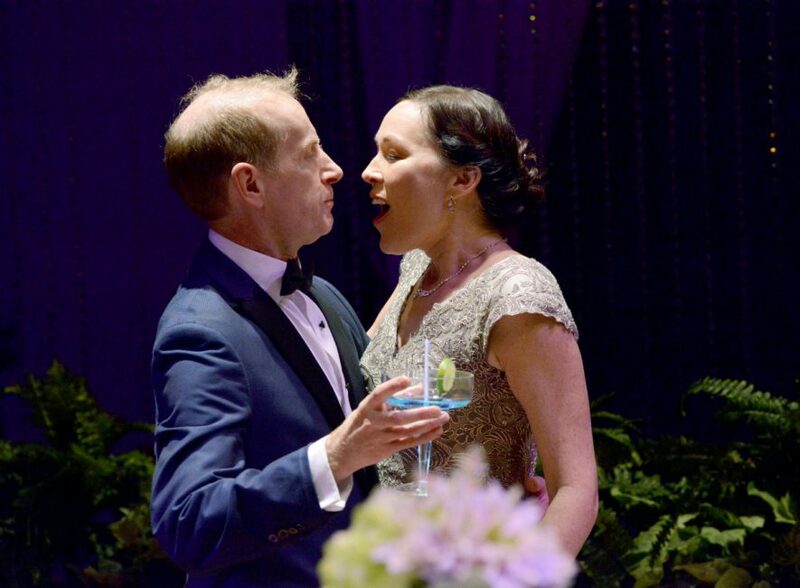 Kristen Thomson’s new play The Wedding Party opens not only the 34th season of Crow’s Theatre, but has the honour of being the inaugural production of the new Toronto theatre Streetcar Crowsnest. Those of us who have been to a few weddings (or a few dozen, as the case may be) will know that although the wedding day is ostensibly about the bride and groom, they are often unavailable and unseen to most of the guests. This show takes that fact and makes a joke of it, since we literally never get a glimpse of the bride and groom, Sherry and Jack Jr., although they are often referenced. Instead, the story follows the narratives of the family and friends of the couple, and their various conflicts and crises. And this makes sense, since wedding days are also excellent catalysts for drama. Egos emerge from the ether: who paid for the day, what they feel entitled to, who has something to prove, who wants recognition and for what and from whom and on and on it goes. Add to that mess the question of class disparity and you have the story of The Wedding Party. We have Jack Sr., the groom’s father who is also, contra tradition, footing the bill for the occasion despite his snooty reservations about Sherry. We don’t find out much about Sherry until nearer the end of the show, except the two points that get driven home again and again by the groom’s family which is that she’s a ‘well endowed’ librarian, which seems code for the fact that she is quite the opposite of what women should be, at least in white upper class wasp culture (namely wispy and intellectual). Which brings us to Alice, a beautiful academic, Jack Jr.’s best friend and ‘best man’, who has been in love with Jack Jr. for years and has been summarily passed over in favour of Sherry, much to Jack Sr.’s chagrin. Jack Sr.’s wife, Margaret, is an older version of Alice (literally, since they are both played by Moya O’Connell) and is, by extension, the same cookie cutter model of what a proper wife should be. Margaret’s frenetic hosting energy masks her neurotic repression of her own dissatisfaction in her life and her marriage as she tries her best to smooth out the social fissures which proves to be too big a task because of both Sherry’s gregarious mother (played by Thomson herself) and Jack Sr.’s estranged twin-brother Tony (both of whom are played by Tom Rooney). Chris Abraham’s direction is clear and crisp, the pace and rhythm of the show is excellent, and the depth of the humour is impressive. Clear choices lie behind every single delivery, giving each moment a density of meaning and dimension of feeling that is absolutely absorbing. Each actor plays several roles, and unsurprisingly the characterization of each is distinct and robust. Some of the costume changes are impressively quick (Ming Wong deserves kudos for excellent costume design). Rooney plays twins who never appear on stage at the same time, and despite the confusion of the other characters, the audience is always clear on who is who, not an easy feat. The only part that left me feeling unsure is the ending- a comedic tango. There was something absurdly funny about it, but somehow I was left with a feeling of fragmentation, like I wanted some sort of authentic moment to contrast with the intense conflict of the rest. Perhaps, though, it is this very romantic aspiration that the play was making fun of with the final dance; perhaps the point was that such a resolution is beyond the characters of this play, and that the best we can hope for is a simulation of romance – a funny yet bittersweet ending to such a chaotic story.